In The Moonrakers of Avon the action takes place at Christmastime. Before the story begins to unfold, Danny Clark is looking forward most of all to Twelfth Night; why then and not Christmas itself? Today’s Christmas traditions have evolved over the centuries from pagan winter customs, Christian ceremonies and taking in familiar items introduced by the Victorians, such as decorated trees, cards, crackers and Father Christmas. For a brief time, when Cromwell ruled in the 17th century, Christmas was banned. Luckily it was reintroduced and by the late eighteenth-century Christmas celebrations were back in full flight. How then would Danny and his friends have celebrated Christmas? For the poor, it meant lean times. Work stopped for the holidays, though a respectable landowner would look after his tenants and workers. Gifts of money, food and items like blankets were given. 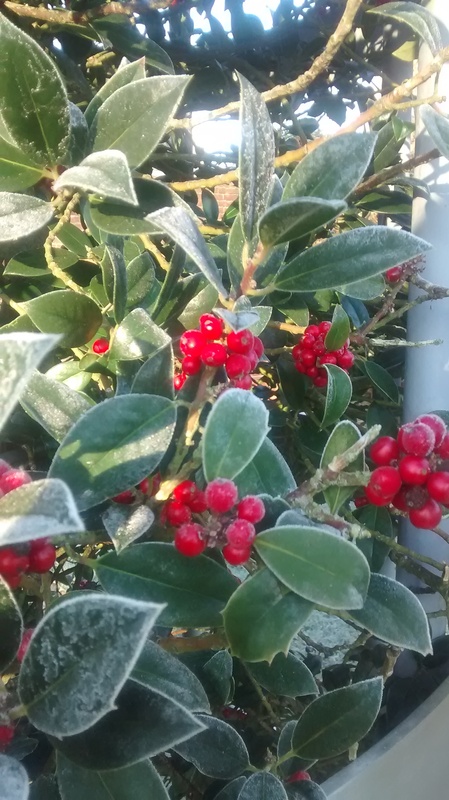 The winter solstice meant the end of the drawing in of the days and the lighter, longer days were on their way, a time to look forwards, a time to celebrate. The return to work for agricultural workers came on the first Monday after twelfth night and was called Plough Monday. The day before, ploughs would have been taken along to the church to be blessed in hopes of a fruitful year to follow. Rich and poor alike would decorate their homes, though decoration was left until Christmas Eve, to do so any earlier was considered unlucky. Yule logs would be placed on the fire on Christmas Eve, though traditionally Yule began at the winter solstice. 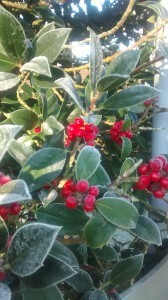 Whilst trees were yet to be a feature of Christmas, homes were decorated with greenery, traditionally holly, ivy, mistletoe and other evergreens. Herbs, such as Rosemary and Bay were also used. Kissing boughs, spheres of greenery with ribbons, candles and spices were popular too. They were hung from ceilings and above doors under which people would greet each other and embrace. Gift giving was a feature of Christmas. Gifts to each other were given prior to Christmas Day, on 6th December, St Nicholas’ Day, the tradition across Christian western Europe. Gifts were also given to servants and tradesmen on St Stephen’s Day, what we now call Boxing Day. This is because the gifts were in the form of Christmas ‘boxes’ and were small handouts of money. The better off would give alms and gifts at Christmas to the poor, usually via the church. Reverend James Woodford, in his Dairy of a Country Parson, 1759-1802, tells us he invited seven poor men to dine with him on Christmas Day. They ate ‘surloin of roasted beef’, ‘plenty of plumb pudding’ and ‘mince pies’. They were also give one shilling each. Wealthier people had the means to make the Christmas season one of fulsome eating, drinking and partying. The larger houses would welcome their families and friends, who might stay for weeks. Christmas Day itself usually consisted of a visit to church and then home to parlour games, singing, storytelling and plays. The latter might also have been provided by mummers and travelling players. This could easily have occurred in Christchurch as Southey lived for a short time in Burton. The festival he is referring to is twelfth night and the cake is Twelfth Cake. Twelfth night was the culmination of Christmas and rich and poor would have had family get togethers, make music and mark the end of the Christmas season. ‘This was twelfth-day, on which a great deal of jollity goes on in England, at the eating of the Twelfth-cake all sugared over.’,’ ‘I took a whim that between St Paul’s and the Exchange and back again, taking the different sides of the street, I would eat a penny twelfth-cake at every shop where I could get it. This I performed most faithfully. Twelfth cake was an extravagantly decorated rich fruit cake, it was the day’s centre of attention, even forming part of the play-acting that traditionally took place. The ceremony Boswell refers to is where everyone in the household would enjoy a piece of the cake and somewhere inside was a dried bean and a dried pea. Whoever found these became the King and the Queen for the day – this could include the servants. Whilst the tradition of the twelfth cake goes back centuries, the first written recipe for the cake is found in, The Art of Cookery Made Easy and Refined, published in 1808 by John Mollard. As well as the cake itself, Mollard also gives a recipe for the colouring and garnishing of the extravagant cake. 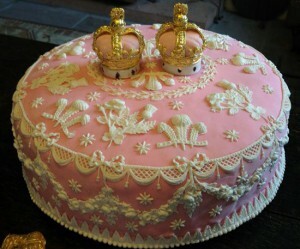 In addition to elaborate decoration, the cake was usually topped with two crowns. There were other traditional foods eaten. A look at Hannah Glasse’s 1774 cookery book, The Art of Cookery Made Plain and Easy, shows much of the food on offer was rich and made with huge quantities of ingredients. Yorkshire Christmas Pie uses a turkey, a goose, a partridge, a pigeon, woodcocks plus ‘what sort of fowl you can get’. Also into the pie went ‘at least four pounds of butter’. 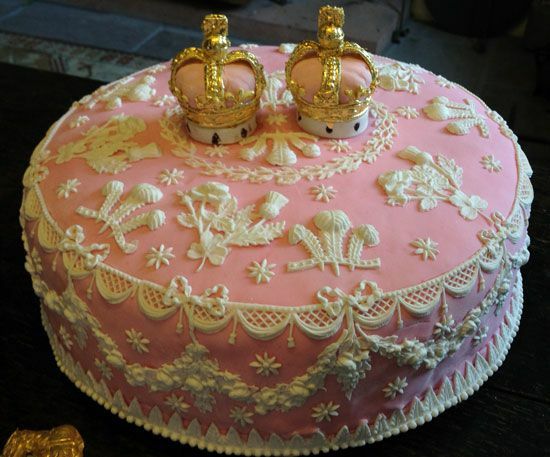 This creation took ‘at least four hours’ to bake. It came with a thick crust, as it was often offered as a present and given the unsteady nature of transport, needed to be of sturdy construction. Her recipe for ‘A good crust for great pies’ is made from a peck of flour (10 – 12 pounds) half a pound of fried suet and a pound and a half of butter. However, the Christmas Pie took a bushel of flour – that’s 42 – 48 pounds! Mince pies were made and included meat, such as beef, as well as the suet and fruits we recognise today. A Christmas porridge was made with large amounts of fruit and alcohol and there were also plum puddings. I have copied some of Glasse’s recipes below along with the Mollard Twelfth Cake recipe. Take white chalk six ounces; eyes and claws of crabs, of each and ounce; oil of nutmeg six drops; make them into a fine powder. About a dram of this in a glass of water is an infallible cure for the heart-burn. 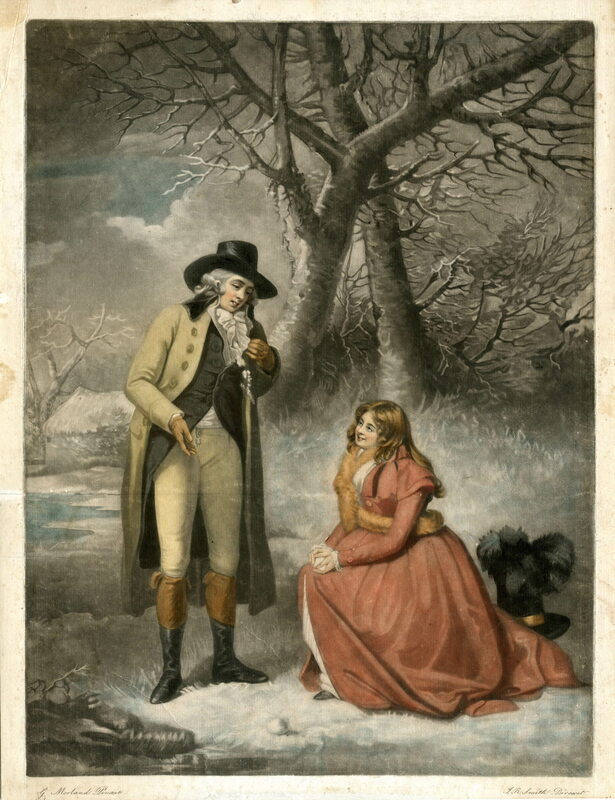 Life in the 18th century was very hard, but nonetheless people celebrated Christmastime, gave gifts, decorated their homes and, above all, enjoyed twelfth night as the culmination of the season’s festivities. The wealthy made it a duty to give gifts to those less fortunate. Christchurch would have been the same and in a future blog I will also show how, in the 18th century, the townsfolk liked to party – Christmas or not! Christmas Gambols. Print by John Raphael Smith (publisher/printer; printmaker; British; 1751 – 1812). Reproduced under licence from the British Museum. To make red Colouring for Pippin Paste, &c. for garnishing Twelfth Cakes. Take an ounce of cochineal beat very fine ; add three gills of water, a quarter of an ounce of roche-alum, and two ounces of lump sugar ; boil them together for twenty minutes, strain it through a fine sieve, and preserve it for use close, covered. Take three pound of suet shred very fine, and chopped as small as possible, two pound of raisins stoned, and chopped as fine as possible, two pounds of currants nicely picked, washed, rubbed, and dried at the fire, half a hundred of fine pippins, pared, cored, and chopped small, half a pound of fine sugar pounded fine, a quarter of an ounce of mace, a quarter of an ounce of cloves, two large nutmegs; all beat fine; put all together in a great pan, and mix together with half a pint of brandy, and half a pint of sack; put it down close in a stone pot, and it will keep good four months. When you make your pies, take a little dish, something bigger than a soup plate, lay a very thin crust over it, lay a thin layer of meat, then a thin layer of citron cut very thin, then a layer of mince-meat, and a thin layer of orange-peal cut thin, over that a little meat, squeeze half the juice of a fine Seville orange or lemon, and pour in three spoonfuls of red wine; lay on your crust, and bake it nicely. These pies eat finely cold. If you make them in little patties, mix your meat and sweetmeats accordingly. If you choose meat in your pies, parboil a neat’s tongue, peel it, and chop the meat as fine as possible, and mix with the rest; or two pounds of the inside of a sirloin of beef boiled. First make a good standing crust, let the wall and bottom be very thick; bone a turkey, a goose, a fowl, a partridge, and a pigeon. Season them all very well, take half an ounce of mace, half an ounce of nutmeg, a quarter of an ounce of cloves, and half an ounce of black pepper, all beat fine together, two large spoonfuls of salt, and then mix them together. Open the fowls down the back, and bone them; first the pigeon, then the partridge, cover them, then the fowl, then the goose, and then the turkey, which must be large; season them all well first and lay them in the crust, so as it will look only like a whole turkey; then have a hare ready cased, and wiped with a clean cloth. Cut it into pieces; that is, joint it; season it, and lay it as close as you can on one side; on the other side woodcocks, moor game, and what sort of fowl you can get. Season them well and lay them close; put at least four pounds of butter into the pie, then lay on your lid, which must be a very thick one, and let it be well baked. It must have a very hot oven, and will take at least four hours.